The Heather course at Boyne Highlands – the Robert Trent Jones Sr. design that got the golf boom started in the area – is marking its 50th season and the most upscale of the Boyne layouts – Bay Harbor – is marking its 20th season. For Bay Harbor it’s more than just a case of turning a page on the calendar. On June 15 what is now the Renaissance Inn at Bay Harbor will drop the Renaissance brand and become a member of Marriott’s Autograph Collection. That’s Marriott’s highest end property. There are only 100 worldwide and Bay Harbor will be just the second in Michigan. Though Bay Harbor’s stunning three Arthur Hills-designed nines on Little Traverse Bay won’t change, the overall facility will get a more manageable name (Renaissance will be dropped from the title) and an upgrade in stature. It’s definitely a big deal. “By being part of the Autograph Collection we’ll be exactly what we need to be without changing to fit a brand,’’ said Erin Ernst, Boyne’s director of communications. Views of Lake Michigan are the featured attraction on the three nines at Bay Harbor. The Inn at Bay Harbor opened in 1998 and joined Marriott’s Renaissance brand in 2003. Members of the Autograph Collection are all uniquely different, and the Inn at Bay Harbor has been working towards that eventuality. A $2 million renovation, in which the lobby area, café and 35 guests rooms were redone, is in the final days prior to completion. There’ll be two more phases to the renovation. The second will begin in January, when the spa and workout area will be the focus. The final phase will begin in the winter of 2018. Meanwhile, the celebrating of The Heather’s No. 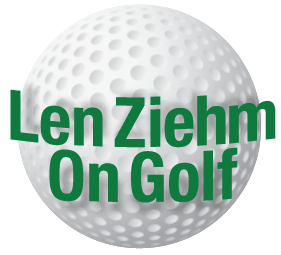 50 anniversary will be done largely on the course. 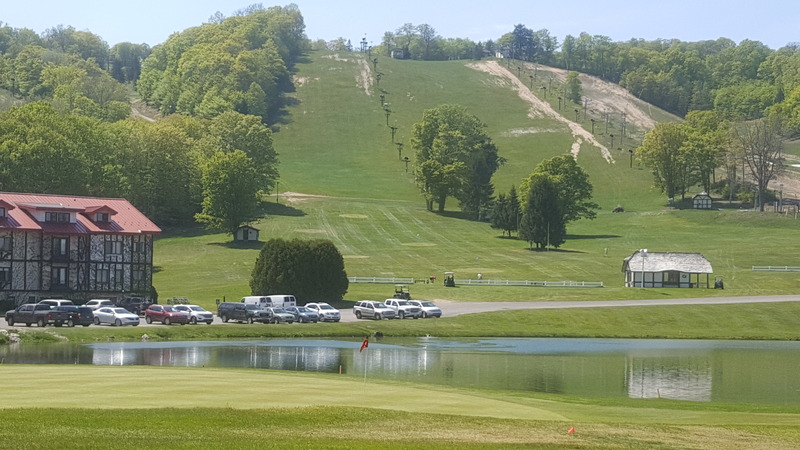 Bernie Friedrich, vice president of golf and retail for Boyne USA, said a $50 special rate to play The Heather would be offered after 1 p.m. for every Thursday in June. 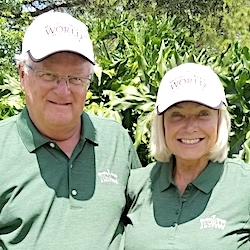 The formal anniversary celebration will take place on Aug. 20 when all the past Heather head professionals (there were only seven in 50 years, and all still live nearby) return to play in an outing with members and guests. They’ll all take caddies for that special occasion. While water-front views dominate at Bay Harbor, my most striking is this shot on the Quarry nine. The Heather certainly has held its own over the years as Boyne Highlands added the Donald Ross Memorial, The Moor and the Arthur Hills Course. 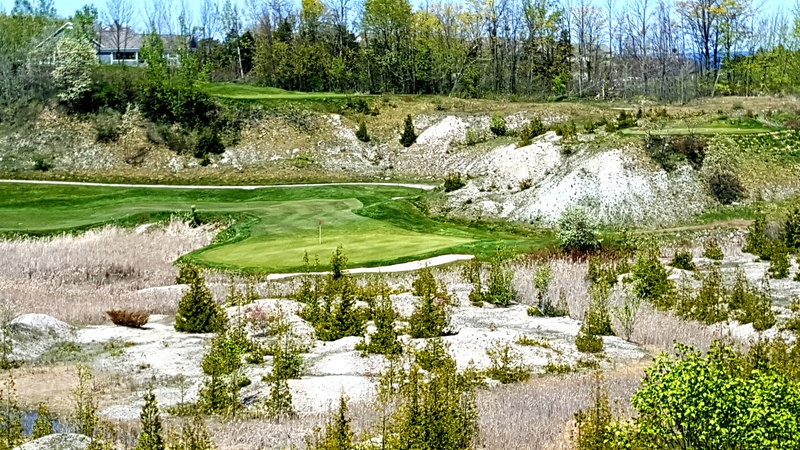 Boyne Mountain now has its Alpine and Monument layouts and Bay Harbor – in addition to the Links, Quarry and Preserve nines – has Crooked Tree nearby. They all come under Friedrich’s jurisdiction and he instituted the price-yielding (or dynamic pricing) concept last year. 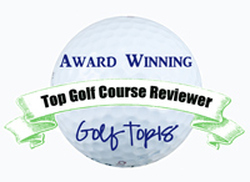 As is the case with so many things in Michigan golf, Boyne was the first to try it. 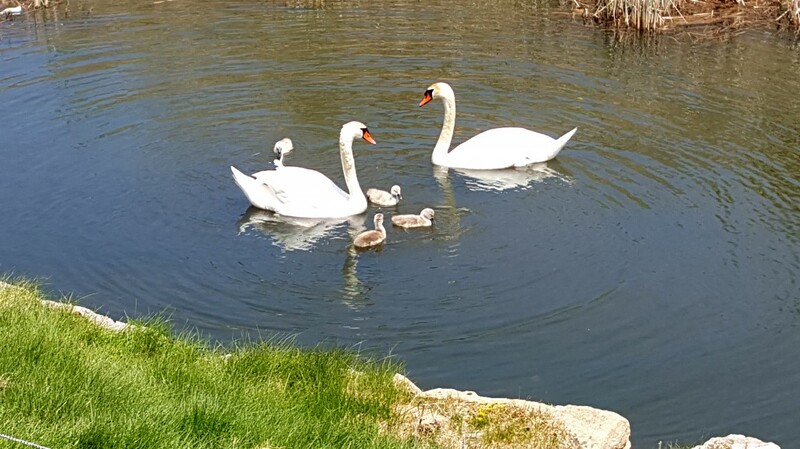 This family of swans may be enjoying Bay Harbor, but this course is certainly not for the birds. Friedrich calls the concept – still not in widespread use nationally — “very successful ‘’ and has the statistics to back it up. Next new thing on the docket are GolfBoards. Four are in use now at The Moor and the Donald Ross Memorial. Eight more will be coming soon. 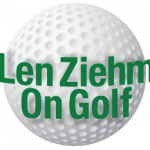 “We’ve got a waiting list for them every day,’’ said Friedrich, who is attuned to all the changes in the golf marketplace since his arrival in Northern Michigan in 1975. He notes that Boyne’s clientele isn’t so local any more. Michigan has 685 public courses, down from the 700-plus in recent years, but is still second only to California in the number of such layouts. A ski hill at Boyne Highlands has now been transformed into a practice range for The Heather course.